The most iconoclastic and musically adventurous artist to emerge from the 1960s rock music scene, Frank Zappa and his amalgam of rock, jazz, classical, blues, social and political commentary, and satire were a mainstay on the fringes of 1960s and 70s popular music with the occasional foray into the mainstream. In the 1980s he became well known for his political activism against censorship and in defense of free speech. Since his death from prostate cancer in 1993, his music and interviews have continued to be influential, and it's inarguable that the world in its present state would surely benefit from some of his withering social comment and insight. 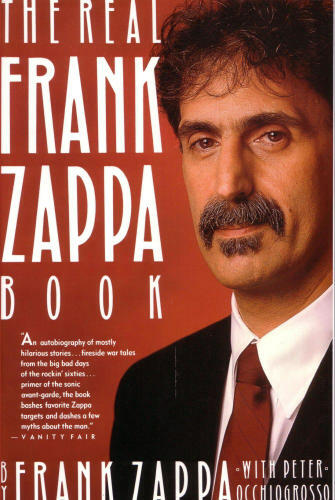 The closest we'll get any of that straight from his mouth is The Real Frank Zappa book, a quasi-memoir he wrote and published in 1990. I first read this book back around 1993 right before he died when I was just getting into Frank's music; I remember laughing hysterically at some of the anecdotes and being surprised at how many swear words he used throughout the book! As I got older, I re-read it a few times, but it had been many years since I'd last gone through it and so, for this review I've given it a fresh re-reading. Before getting into the details, I want to point out that anyone going into this book expecting a traditional sort of autobiography will be a bit disillusioned. While the early chapters deal with Zappa's childhood, the formation of the Mothers, and his career into the mid-1970s, the bulk of the book is more like Frank's personal manifesto. Yes, there are chapters dedicated to road stories and some of the more colorful events from his career (mainly in the early years), but the majority of the chapters are dedicated to specific topics that Frank pontificates on and on which he espouses his personal philosophy. These include matters such as parenting, religion, politics, technology, and music. For each of these, he lays out his thoughts on the matter and in some cases, how he would change or improve them. In light of all of the upheaval and change in just about all of these areas in the twenty-three years since his death, it's especially fascinating to read his thoughts on matters that are just as topical and relevant now as they were when he was writing this book in 1988. In particular, his personal politics (where he calls himself a "practical conservative") and his thoughts on the music industry resonate almost as much now as they did then. This brings me to one salient point regarding the book...it is more than a bit dated and as such, frozen in its own time. The same has recently been said of Frank's own music and, strangely, I've no doubt he would agree. Most of his ire is directed toward politicians (mainly Republicans, although Democrats don't escape his wrath), evangelical religious groups, drugs (Frank was strongly anti-drugs), communism, and music industry executives. While some of the matters he discusses transcend their time, for anyone born after 1990 it will probably sound like ancient history to read about Reagan, Bush, Nixon, Carter, the USSR, 1980s AOR rock music, and 1980s televangelists. What it all does point out, though, is that he would have a field day with how insane and crazy modern society and the world as a whole have gotten in the years since his death, and it makes me wish he were still here so that we could read the inevitable blog or Twitter he would have as he offered his social commentary. In general, The Real Frank Zappa book is enjoyable and informative as the only direct word on his life from the man himself. It's entertaining and humorous in Frank's own unique way, but he also shows a few glimpses of tenderness and love (ironically after he states early in the book that he HATES love songs and love lyrics). It's touching and also quite sad to read of his love for his wife and kids, especially with all of the recent drama that's been aired in public over the last several months as his four kids fight over administration of his trust in the wake of their mother's death. The chapter about how his marriage worked best (he worked all night alone in the studio, Gail spent all day taking care of the kids and the business aspects of his career, with minimal interaction between them) perhaps explains why things went downhill in her relationship with their children in the wake of his death without Frank there to act as a buffer. However, it comes across very loud and clear that he loved his children a lot and that he was very proud of all of them. Elsewhere, he goes on and on (and on...) about some of the things that annoy him and honestly, having listened to his music and interviews for almost twenty-five years, it did get a bit tiresome to read the same ire directed at the usual matters, but for someone who isn't as heavily into all things Zappa, this probably won't be a problem. He comes across as a highly intelligent and outspoken individual who really just wanted to be left alone to do and say what he wanted and to live his own life on his own terms. He was also much more than just a great rock guitarist and withering lyricist. In the latter part of his life and career he was much more interested in composing and conducting his first love: orchestral music. His tales of the trials and tribulations in bringing his various classical projects to fruition were funny and depressing at the same time as he busts a lot of the myths behind modern orchestras and the musicians who play in them. He does sometimes come across as fairly misanthropic and contemptuous of the average person, but at the same time there is more than a grain of truth hidden in just about everything he says. Like everything he discusses in the book, Frank is uncompromising in his views and whether you agree with him or not, at the very least he pushes you out of your comfort zone enough to make you stop and think. I don't know how I could say that this book is anything other than essential for Frank Zappa fans. It's funny, intelligent, thought-provoking, and a bit irritating (in a good way...it challenges entrenched thinking and pushes you to at least think outside of your usual mental bubble), just like the man himself. There aren't a ton of revelations in terms of information about his bands, albums, or career so anyone looking for a detailed history of Frank's career won't find it here...there are other books that attempt to cover that ground. Rather, you get a taste of what his childhood was like, some of the highlights (lowlights?) from his long career, and a philosophy manual from one of the most musically adventurous, politically and socially intelligent, and one-of-a-kind geniuses of 20th century music.